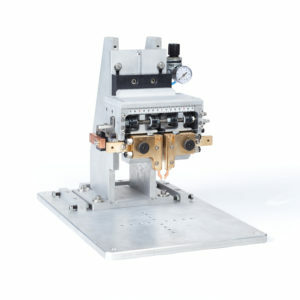 Easily integrated on a frame or in a special machine. This parallel clamps is specially designed for the requirements of the automotive market. Its self-centering system with limit stop, sensors and hydraulic dampers enhances productivity and welding quality. High-precision guide rails and pads. Self-centring with adjustable, visible limit stop. Quick change system for electrode holder. Supplied with air regulator, solenoid valve and proportional valve enabling the force to be controlled by Soudax generators. Hydraulic damper guaranteeing smooth opening and closing.